Dental implants is the ideal solution if you are missing teeth. Whether you are missing one tooth or several or all your teeth, this treatment is becoming the standard of care. Dental implants not only look and feel just like your natural teeth, but they also will provide the same level of functionality that you are used to. We’re dental implants in Houston specialists & can help. There are two main components to a dental implant and two procedures involved in placing it. First, a titanium post is implanted into your jawbone. This acts just like a natural tooth root. Then, a porcelain crown is placed on the post. This takes the place of the visible part of the tooth. You can see these two components in the diagram. The titanium post fuses to the bone in a process called osseointegration. The implant needs to integrate solidly with the bone in order to withstand the stresses of tooth function. If osseointegration is incomplete before stress is placed on the implant, it could become loose and eventually fail. Also, the presence of the implant sends a signal to the bone that prevents the bone resorption that would otherwise take place when you have a missing tooth. Dr. Coleman has expertise in both the surgical and restorative phases. This is an added bonus for the patient because it is not uncommon for miscommunication to take place when there are multiple dentists, surgeons, or specialists involved. Dr. Coleman can take care of it all. Dr. Coleman is also committed to staying at the forefront of implant technology. He has 3-D CT scanning capabilities in the office which give him a complete picture of the location of nerves, blood vessels, the sinus cavities, as well as the the bone density of the jaw. Having this state-of-the art technology further reduces the risk of complications in the surgical placement. Most patients don’t realize that implant dentistry is not a recognized specialty area within dentistry. This means that any dentist can legally do dental implants without any additional training beyond dental school. But to do these procedures correctly requires extensive post-graduate education. So when selecting an implant dentist, be sure to check out the dentist’s credentials, training, and track record. 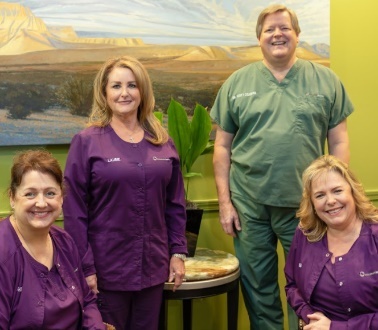 Dr. Coleman has extensive training and experience with both parts of dental implant treatment – the surgical placement of the implant and the restoring of the crown. He has over 30 years of experience successfully placing dental implants. Dr. Coleman has also earned Fellowship status with the International Congress of Oral Implantologists. Fellowship in the ICOI requires the completion of over 75 hours of implant dentistry post-graduate training, at least 20 case reviews of his personal dental implant patients, and letters of recommendation from other experts in the implant dentistry field. They are a durable, permanent solution to replace missing teeth. Chewing efficiency will not be reduced because implants function just like normal teeth. No one will be able to detect that the implants aren’t your natural teeth. Two, four, six, or eight dental implants can be placed in addition to a denture, and the implants will stabilize the denture. For one or two missing teeth, using dental implants avoids needing to place crowns on adjacent teeth that may otherwise be healthy. Thus this is a more conservative treatment option. Implants prevent facial collapse. To learn more about this bone loss condition, please visit our facial collapse page. The entire procedure can take up to six months. This is due to the healing process that must transpire before the crown is placed. Dental implants are more expensive than some other tooth replacement options. So if you are considering dental implants, we will present all of your options and will work together with you to come up with the right treatment plan for your unique situation. If you are missing a single tooth, and if the teeth on either side need crowns anyway, it may make more sense to do a bridge than to place an implant.